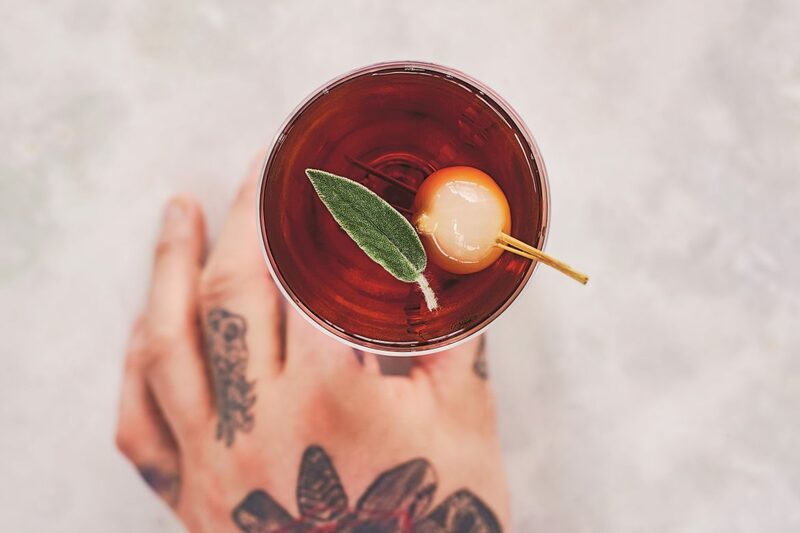 International award-winning bartender, Rich Wood is at the forefront of modern cocktail development bringing new flavours concepts and processes to the art of mixology. His new book The Cocktail Guy features 70 of his unique recipes along side guides on the elements of a cocktail, from the ice, to the traditional mixing equipment, and modern techniques such as infusion. Rich oversees the constantly developing list of cocktails available at SUSHISAMBA and Duck & Waffle in The City, and this November they’re featuring a number of cocktails from his book, including this, the Caramelized Red Onion Manhattan. At London Lamppost we think it’s a superb book whether you’re a novice or expert, as there’s something for everyone in it, recipes for all skill sets with Rich’s friendly tone imparting new knowledge to even the most experienced home cocktail maker. Pop along and try his drinks expertly prepared at SUSHISAMBA and Duck & Waffle, or try you’re hand at home with the Caramelized Red Onion Manhattan thanks to the bellow recipe taken from The Cocktail Guy with the kind permission of Pavilion. At first glance, you’d be forgiven for thinking that I’ve lost my mind – ‘Onion! In a Manhattan? He’s messed up a Gibson, surely’. But despite the juxtaposed nature of this drink, this was no accident – happy or otherwise. The idea behind this was to create flavours similar to those enjoyed whilst eating a roast dinner. The sweetness of the caramelized onions, despite their sharp nature, adds a layer of complexity to this drink that melds with the flavour of sage to create something deliciously savoury and redolent of delicious sage and onion stuffing. Don’t be fooled though, if you’re too heavy handed with the onion it will overpower the drink – balance is key! To make the cocktail, place all the ingredients in a shaker or mixing tin and fill with good-quality cube ice. Stir with a bar spoon until icy cold, then gently strain into a pre-chilled Martini glass. Garnish with a skewered pickled onion and sage leaf and serve. Place the sugar in a pan over a medium heat and cook until syrupy and golden, do not stir the sugar as this will cause it to crystallize. Add the red onion extract to the pan and stir to combine, then remove the pan from the heat and carefully pour in half the vodka. Return the pan to a low heat and add the sage leaves. Continue to heat, stirring occasionally, until the caramel has melted into the vodka, then remove from the heat and set aside to cool. Once cooled, add the remaining vodka, then strain the liquid through a muslin-lined sieve (strainer) or coffee filter into a non-reactive container with a lid. Image credit to Haarala Hamilton.